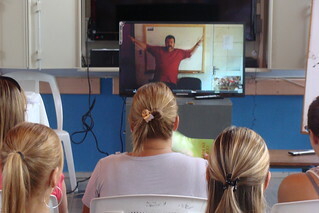 Due to a lack of of qualified and experienced teachers in Uruguay, English is being taught in primary classes all across the country via video conferencing, using teachers from elsewhere (including Argentina, the Philippines and Mexico). Because there are two teachers, a classroom teacher (CT) and a remote (RT), a new type of methodology is being developed that combines elements of distance learning, team teaching and blended learning, but which also requires a unique approach. One of the ways the Plan Ceibal English programme is able to work is through the use of a specially-written lesson plan that allows the (generally non-English speaking) classroom teacher (CT) to follow what the remote teacher (RT, the English teacher) is teaching in Lesson A, and also that allows her to carry out the practice activities in the follow-up lessons B & C, when she is alone with the children. The English lessons in Plan Ceibal look (as far as I can see) pretty much like most Young Learner English lessons. They include monsters and songs, basic grammatical patterns, the sort of vocabulary you'll find in most general English coursebooks, and scripts (with quite a lot of Spanish thrown in) to guide the distance teacher. There are actually two versions of each scripted lesson plan, one in English and one is Spanish. 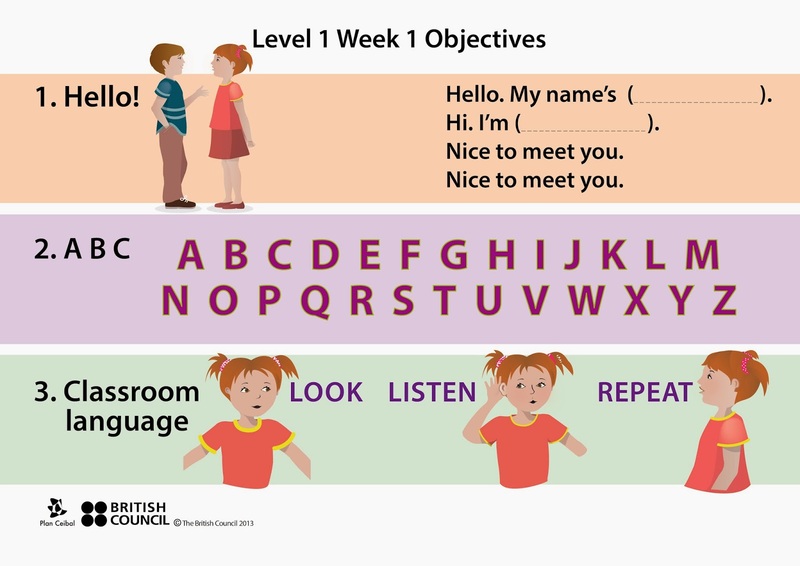 The Spanish version allows the classroom teacher to understand exactly what to expect to happen during the remote (class A) lesson and what they need to do to practise in the follow-up (classes B & C) lessons. This seems to be working well. The survey of classroom teachers that was undertaken last year (650 out of a total of 985 CTs responded) showed that 65% of the CTs used the lesson plans almost always for classes B & C. 33% said they used them sometimes, and only 2-3% stated they never or almost never used them. It's also great to see that 98% of the CTs evaluated the digital materials of the programme positively. The lesson plans were (and are still) being written by a team of writers based in Argentina, led by Cristina Banfi and Silvia Rettaroli, and it is thanks to their hard work and those of their colleagues that they are working so well. The authors (Banfi and Rettaroli, 2012) drew on curricular content to teach English and established curricular and procedural bridges with the Uruguayan primary school curriculum. The course authors justified the adopted approach on the necessity to encourage language use related to learners' experience of the world and their formal education trajectories. 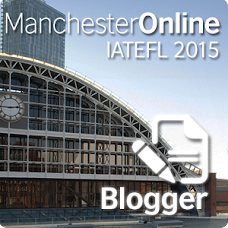 This led to developing lessons which responded to learners' interests and context. In a future blog post, I'll be looking at one of these lesson plans in detail. In preparation for the next expansion of the Plan Ceibal English project (we are going to be moving from teaching 1,000 classes a week to 2,000 from March/April 2014), we have started a series of orientation courses for classroom teachers. The first of these took place in the north-west of Uruguay, in Rivera and Artigas (see picture left), near the border with Brasil. One thing that's special about this project is that the classroom teachers who take part in the project are all volunteers. They are not forced to join and participate in the primary English programme. Fortunately, there have been no shortage of classroom teachers willing to join so far, and the project has benefited from word-of-mouth from participating classroom teachers and the overwhelming positive feedback from kids and parents. The orientation course format used to be two days, but has been reduced to one day because it was felt that this is sufficient as an introduction for the teachers. The course has been supplemented with an excellent 12-hour online self-access course (specially developed for the project by the consultants-e) that classroom teachers do before the teaching starts. Because very few of the Uruguayan classroom teachers speak English, both the online course and the orientation course are delivered in Spanish. 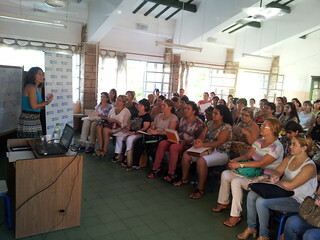 The programme of the orientation course starts with an introduction to the project and then the 100 or so classroom teachers are split into two and receive input sessions on Learning a Second Language (see presentation below), the Role of the Classroom Teacher and Remote Teacher, LearnEnglish Pathways (the online self-access English course written by the British Council that all of the classroom teachers are obliged to follow). The orientation courses continue every week in different parts of Uruguay (Montevideo, Rivera, Artigas, Salto, Paysandu) throughout February and March. When classes start again in March/April, primary schools in all departments of Uruguay will be covered by the project. The expansion planned for 2015 is expected to be the final expansion, and the plan is to reach all primary schools in the country (give or take some rural schools where the fibre-optic cable does not reach) - an estimated 4,500 classes per week. Read more blog posts about Plan Ceibal English here.